Kindermusik International is an established community of educators passionately committed to bringing the power of music to children and their families around the world. Since 1978, its research-based music-and-movement curricula have enhanced the lives of millions through the universal language of music, supporting whole-child development and providing the early foundations of future school success. Some Kindermusik classes take place in a private Kindermusik studio, others in an early childhood learning center. 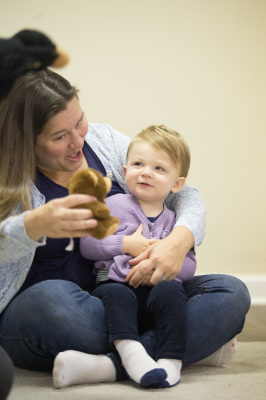 But no matter where the music plays, Kindermusik helps develop critical early-learning skills, nurtures the whole child, and—last, but not least—offers hours and hours of irresistibly engaging music-and-movement fun for babies, toddlers, preschoolers, and their families! Level 3 classes engage preschoolers’ natural love of music and activate their imaginations. A wide range of learning opportunities boosts language skills, confidence, independence, social-emotional skills, and self-control. 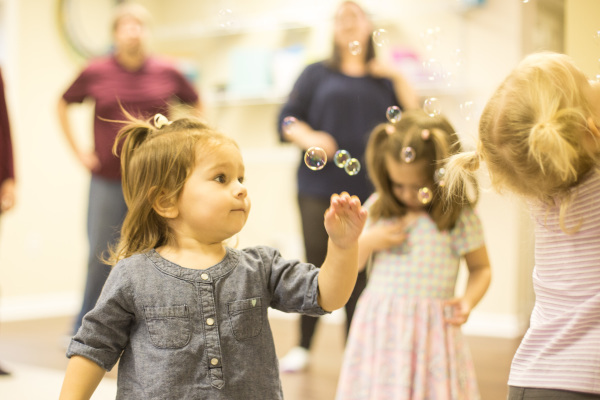 You are invited to join the fun for a portion of each class, sharing in the joy of music-making and learning how your child is developing, all while strengthening your relationship with your child. This is a drop off class for 30 minutes, with the adult returning for the last 15 minutes. Our mixed-age classes are perfect for families who wish to bring two or more children of different ages to the same class, or for parents who simply prefer a mixed-age setting for their child. These classes allow infants through five-year-olds—and their caregivers—to gather together for a fun-filled learning experience. Your Kindermusik educator will help you modify movement activities, group dances, and instrument-play activities for each of your children. "My youngest is 20 months and has been doing Kindermusik since she was 8 months old. This program has really helped her come out of her shell and developed her into the confident music loving toddler she is now. She gets so excited to go to music class to see her friends and socialize and now even requests her favorite songs to be sung at home too. I have enjoyed watching her meet major milestones with the help of Kindermusik from walking to running to now jumping and it has helped her tremendously with her speech and vocabulary as I have noticed how much more she speaks and at a much younger age than my older child. We love Kindermusik at Little Sunshine Music Studio! Much thanks and love to Ms. Pam!" "My daughter is 2 and half years old and started taking classes at the Little Sunshine Music Studio a few months ago. My husband and I enrolled our little girl in order to increase her interaction with kids more her age in a fun environment. However, what we got was so much more. We’ve seen leaps and bounds of improvement in speech, social and behavior skills, and a found love of music and dance. 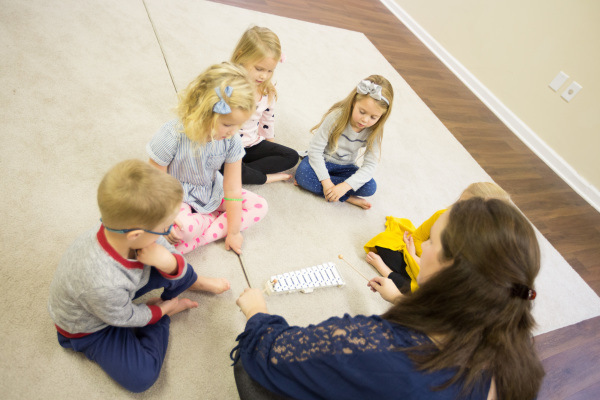 In this short time her vocabulary has expanded, we believe in part it’s due to the monthly themes and the fun way in which the children are taught and asked to engage.For anyone with little ones, I definitely would recommend The Little Sunshine Studio as it’s an amazing way to learn by music and play."